The newest Apple iMac MF886LL/A with Retina 5K display is amazingly beautiful in every way, fitting very high technology into a super thin design. You will really appreciate all that it has to offer if you’re one of those that had enough of the viruses and other evils that trouble the Windows PC’s and want something very fast and powerful with a Haswell i5 quad core processor at 3.5GHz base speed and 1TB Fusion drive with the very first 5K display on the market, that is so perfect and realistic which feels just like looking through a window, with top of the range AMD R9 graphics that is capable of playing the most current games at high settings and more. 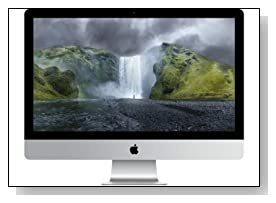 Apple iMac with Retina comes with the 4th generation quad-core Intel i5-4690K processor at 3.5 Ghz speed with up to 3.9 GHz with Intel Turbo Boost 2.0, 8GB (2 x 4GB) DDR3 SDRAM memory at 1600MHz and 4 SO-DIMM slots that are designed to be accessible by the user so it can be expanded up to a maximum of 32GB for super demanding multimedia editing and production, 1 TB Fusion Drive that is a combination of traditional large storage 1TB SATA hard drive and the high performance 128GB Flash Drive that you never have to manage yourself- most frequently used ones will go on Flash drive automatically for better performance and the latest Mac OS X Yosemite that seems to be improved on nearly all aspects, integrating iOS and Mac computers and handling high resolution displays better. Released in late 2014, the 27 inch diagonal Retina display with IPS technology for wider viewing angles up to 178 degrees and 5120 x 2880 max screen resolution is an excellent amazing display which is so perfect that is impossible to see each pixel- super realistic and offers a total of 14.7 million pixels- 67% more than a 4K display and 7 times a regular High Definition TV, AMD Radeon R9 M290X graphics card with 2GB of dedicated GDDR5 memory, offers very high pixel density and superior contrast and you’ll be amazed with how accurate the colours are- whites are brighter and blacks are darker. It comes with the FaceTime HD Camera that you see on other iMacs with built-in dual array microphones for the best live chats on Skype. You will hear superior high-fidelity sound through its stereo speakers- immersive sound and wide soundstage when you’re watching movies or playing the latest games. The new iMac MF886LL/A weighs 21 pounds- 9.53 kg and has the dimensions of 25.6 x 20.3 x 8.0 inches- has an ultra slim 5mm aluminium and glass enclosure display with front and back welded with friction-stir welding. The 78-key wireless keyboard is full size including 4 arrow keys and 12 function keys, and has the wireless Magic Mouse and an optional TouchPad with Multi-Touch Control. Connectivity options include the speedy (up to 3 times faster) and wide coverage three-stream 802.11ac wireless with double channel bandwidth- backwards compatible with 802.11bgn, Bluetooth 4.0 to connect to a variety of wireless devices, 1x 10/100/1000 Mbps Gigabit Ethernet with RJ-45 connectivity, 2 x Thunderbolt 2 ports delivering up to 20 Gbps bandwidth for very fast data transfers, to connect high performance peripherals, 4 x USB 3.0 ports with up to ten times faster performance, an SDXC card slot for when you need additional storage, 1x 1/8" (3.5 mm) Headphone Output and a Kensington lock slot. Conclusion: Apple iMac with Retina 5K display will have to be the best computer there is with the first commercially available 5K screen- some even think that the display alone may be worth the price tag. It is light, very fast, very quiet and uses less energy than previous models with the low voltage yet powerful processor with a Passmark benchmark score of 7753 on day of this review- although not as powerful as a Mac Pro. Fusion Drive comes standard on the new iMac 5K so it boots up much faster and you get overall smooth running of things. The wireless keyboard has no 10-key numeric pad which we certainly do not see as a drawback- you will see what we mean when you start using this keyboard- typing feels so good overall. The R9 M290X graphics with up to 3.5 teraflops of graphics computing power is designed for high end gaming at higher settings as well as awesome smooth performance in other multimedia tasks. You may have seen Retina on smaller screens before, this is something else- so many pixels on a 27 inch screen. The display glass is completely laminated so it is 75% less reflective - coating is super precise so you see the proper vibrant colours, image and text are much clearer and crisper than before, you experience super amazing visuals and 3D graphics. Apple manufactures the oxide TFT based display for vivid brightness to be seen across the whole screen but the new iMac Retina can not be used as an external display on its own, can be used with another screen at the same time and allows 3840 x 2160 screen resolution on that display. 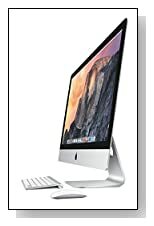 You’re going to love the new iMac with Retina and see that it is worth every cent.